I borrowed this page from a now defunct Japanese web site. I have tried this on some of the older systems with only one step up. After doing this I realized that someone with extraordinary soldering skills and good equipment would want to attempt this. I do use the same trace pens that I use on the G4 systems. Do this at your own risk. You can easily muck up your computer. I analyzed how to increase the clock speed of a iMac. 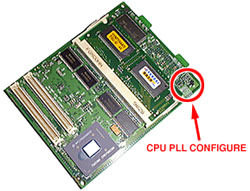 If you adjust the set of Resistors labeled "R117" to "R124" which are under side of "System Module", you may configure the Processor clock PLL. 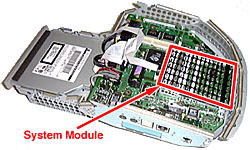 First : You need to take out Logic Board Assembly, and remove "System Module" from "I/O Board". 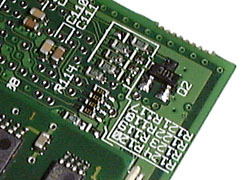 Second : Configure the set of Resistors labeled "R117" to "R124" which are under side of "System Module". This information is not confirmation of stability operation. Please note that any modifications you make to your Macintosh are made at your own risk. Apple, Apple Macintosh, Macintosh, Mac, Power Macintosh, are trademarks of Apple Computer, Inc.